I have made good progress with my Hour Glass Quilt top, and have especially enjoyed the piecing. 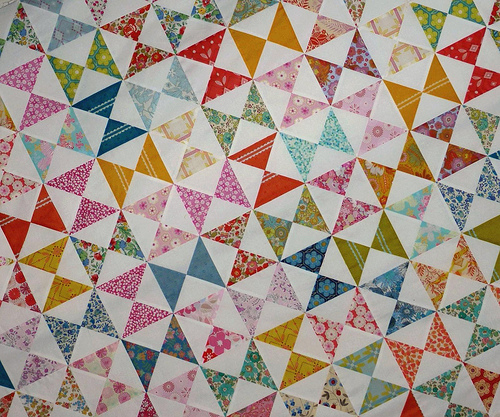 I absolutely love the Half Square Triangle block, it is such a simple and versatile block with countless different layouts making endlessly different quilts. Similarly, the Hour Glass block is an effective traditional block that is not difficult to piece. 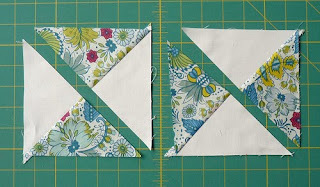 The Hour Glass Block is really just an extension of the Half Square Triangle block in terms of piecing. 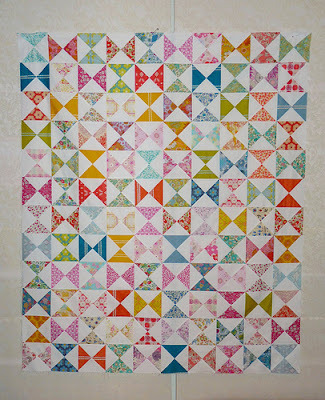 What follows is a short tutorial showing you how I have pieced the Hour Glass Blocks in this quilt top. Step 1 - Cut two 6 inch squares - one printed fabric, one solid fabric. With a pencil mark a diagonal line on the solid fabric. Step 2 - Place fabrics right sides together. With a 1/4 inch presser foot stitch on either side of the marked line from edge to edge. I do suggest you use a neutral thread (when using white solid fabric I suggest using white thread), having used blue thread just for better contrast in this image. Using a rotary cutter cut on the marked diagonal line. 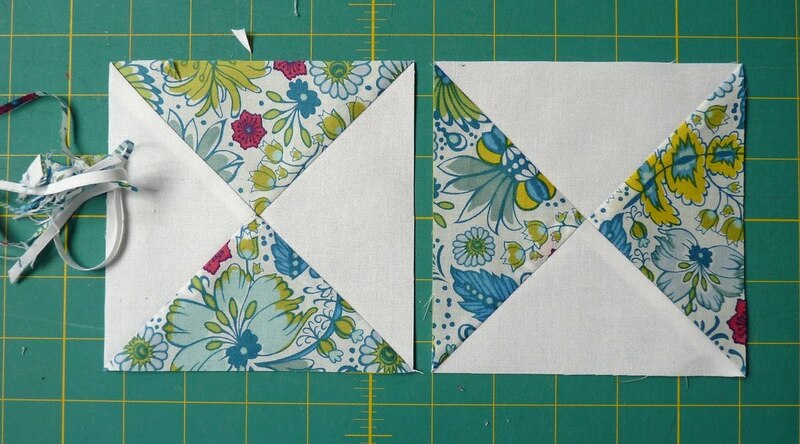 Up to this point this tutorial is no different to piecing Half Square Triangles. Without moving the fabrics on your cutting mat, swing your ruler or mat around to cut your fabric in the opposite diagonal direction. You now have four separate units each one made up of a solids triangle and a printed triangle. 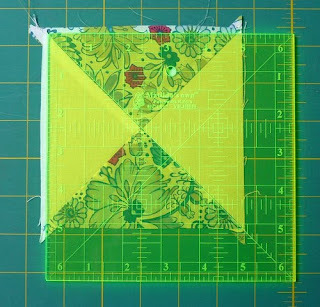 Press all seams towards the darker (printed) fabric for all four units and match correct set of triangles together to form two Hour Glass blocks (as above). 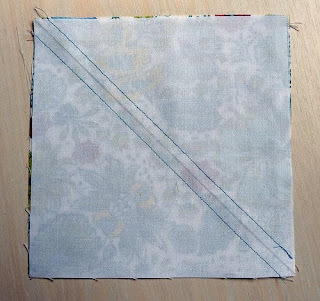 If using all printed fabrics be consistent with the direction you press the seam allowances for all units ~ press all seams towards the same fabric. Sew units together matching the center seams, stitching from edge to edge. Press seams together in one direction. Now for a little housekeeping and to ensure that your blocks are all square, use a ruler with a diagonal line (match diagonal line on your ruler with the diagonal line on your block), and make sure you measure from the center intersecting point out (2 1/2" on your ruler) to square up your blocks. Trim back each block to 5 inches exactly. You will now have two Hour Glass blocks, each measuring 5 inches square. Piece as many blocks as required. For my quilt top I have made 120* Hour Glass blocks pieced together in 12 rows of 10 blocks each. The quilt top measures 45.5 x 54.5 inches with borders still in the planning stages. * To piece 120 Hour Glass blocks, cut 60 solid fabric squares and 60 printed fabric squares. I have used many different Liberty fabrics as well as fabrics from the Little Folks range by Anna Maria Horner. The solid contrast fabric I have used is Robert Kaufman Kona Cotton in White. 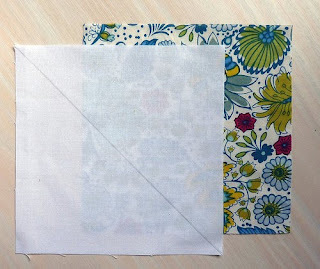 What's more, the Hour Glass block is ideal for using up all of your scrap fabric, as well as those charm packs you just could not resist stashing. Happy piecing! Oh boy, another pattern to add to the "must try" list!! Thanks for the great and easy tutorial! Thanks for the tutorial - I might even attempt to piece something that's not a square (and use up some of my stashed charm packs). 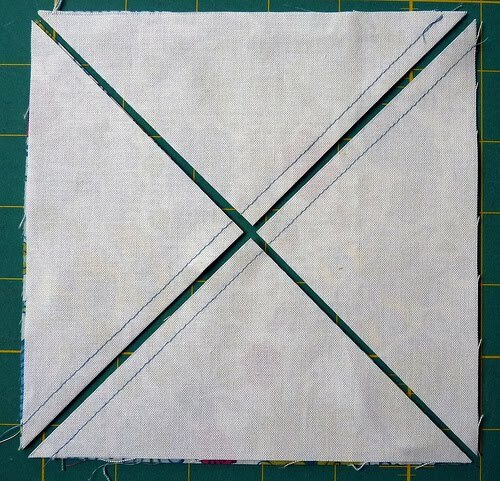 Your tutorial was very clear, and an inspiration for another entry on my "quilts I want to make" list. Thanks for the tutorial. 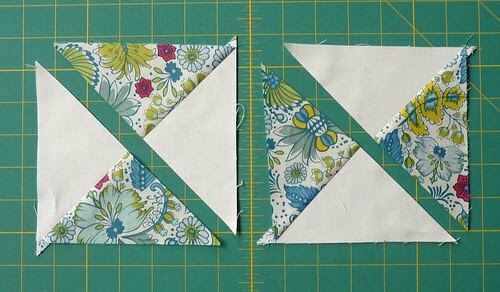 Having just done my first quilt using HST's, I could see that these hourglass blocks were along similar lines but I just couldn't work out how to make them. Thanks! Thanks for sharing. Simple but so effective! I just love this hourglass quilt. The colors and fabrics you chose are awesome! Thanks for sharing. Love & blessings from NC! Great tutorial. Well written, great visuals. This definitely goes into my list of favorite tutorials. Lovely quilt. I prefer this to the klosjes, I think. What about you? Mine too love making them and nine patch also. I love very much the hour glass quilt and until now i do 2 little wall hanging. This quilt is going to be another favourite. Great tutorial (and I'm lusting after some of your fabric)! Just a suggestion for step 7 - when squaring up to 5", make sure you measure from the center intersecting point out (2 1/2" on your ruler). You do that in the photo, of course, but it's a good reminder for someone who hasn't made these blocks before. thanks for this...it looks amazing. what a fantastic quilt top! all of those prints come together to make some eye-candy. great work! i love hsts too. thanks for another great use of them! I love this block, I used a couple of charms and a solid for my granddaughters baby quilt. It is timeless. Great tutorial! Thanks for the cute quilt idea! I have a bunch of 30s repros that would look fabulous with the white background. 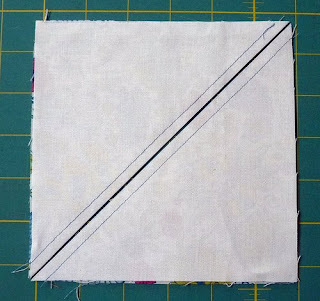 One thing I learned about an hourglass block that might make it even a little more simple is in Step 4, cut between your sewn lines. Then press the seams to the dark sides. 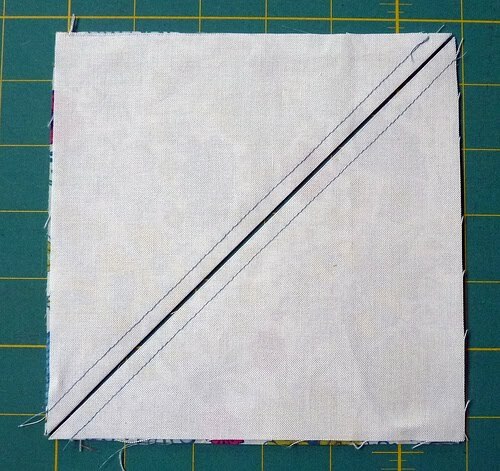 Then face right sides together, opposite colors facing and draw quarter inch sewing lines again. Cut in between sewn lines and press and trim. Thank you so much again for the cute idea! I love, love that white background! How neat. Thanks for this great idea. Thanks for the great tutorial! This is one ofthose blocks that looks complicated, but your tutorial sounds easy-peasy. Hmm.. I like the idea of making the blocks slightly bigger and then trimming them to size so they're all even! It's a beaut! Those prints go so well together and against the white they look positively jewel-like. Thanks for the great tutorial! Your work is very inspiring! Isn't this the same process for quarter-square triangles? I think I'm saving all of my scraps for some hourglass blocks! 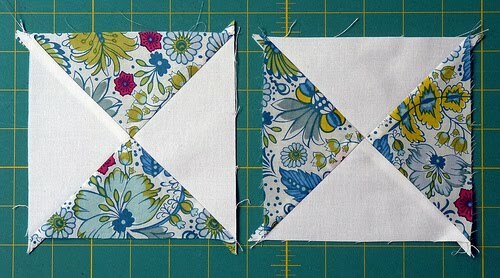 I currently have a charm pack or two that I think I will make into these versitle blocks. I am going on a business trip soon and need to take some projects to sew in the hotel room. Great for chain piecing. Can't wait! Oh my, that looks so fun! So many block ideas, so little time. You lucky ducks who get to quilt all the time have me completely jealous! Thanks Rita for sharing your skills once again - another gorgeous quilt to inspire us all! Thanks for another great tut! Thanks for the tutorial Rita! You make it seem so easy. love the quilt, thanks for the tutorial. So excited. My best friend just had her third baby yesterday (Niamh) and I'm making this for her. I've got a natural coloured cotton for the solid and a range of pinks, yellows and sage greens from my stash. I've cut out my squares and tomorrow, the dodgy bulging disc back dependent, I will get to sewing them together. Can't wait! When you piece them together, how big of a stitch do you do? 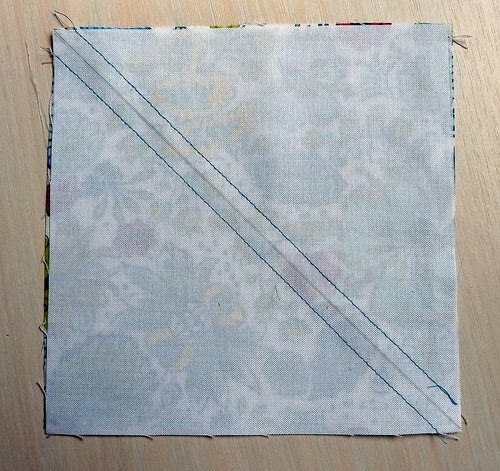 Last year I made my very first quilt - HSTs - without knowing what I was doing. I ended up making three last year, so I learned a lot. My first one for this year (I have four others planned) is a donation quilt for a boys home. 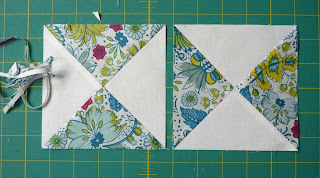 This tutorial helped make the right-sized blocks for half the quilt, and I wanted you to know how much I appreciated this tutorial. Now to find a good one on the alternating blocks!! 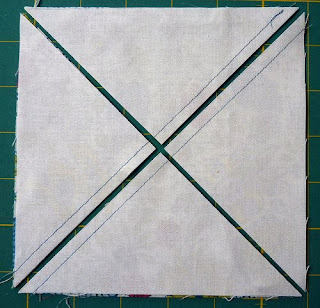 Hi Dee - if you start with a 5 inch charm square (in step 1) then square/up trim to 4 inch square in step 7. Thanks Rita! I used your easy tutorial to make my sister a beautiful quilt - it was my second quilt effort and I am so happy with the way it turned out. I would like to try this after completing my sunbonnet sue quilt. 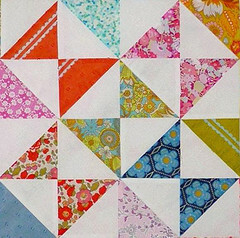 I reay do not know how to properly quilt but I am willing to practice and your tutorial will make it easier. Thanks for sharing.